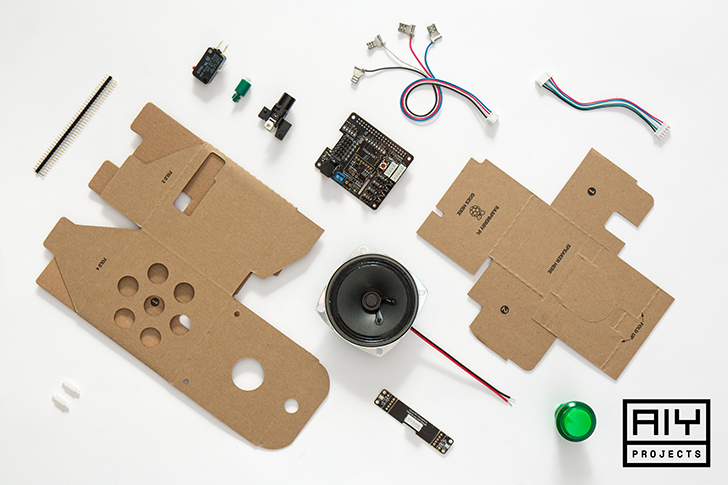 Earlier this year, AIY Projects partnered with Google to develop the 'Voice Kit.' Once assembled and connected to a Raspberry Pi microcomputer, you had your very own DIY Google Assistant smart speaker. Google even added support for the kit to its Android Things OS. But there was one problem - the only way to buy the kit was by finding issue 57 of the MagPi Magazine, which included the kit. The demand was high as well; a reprint from earlier this month sold out in 17 minutes. Now that there definitely aren't any copies of #57 left, AIY has partnered with Microcenter to sell the Voice Kit in retail stores. The bundle includes a 3" speaker, a push button, a cardboard box and frame, a microphone, and various other electronic components. However, it doesn't include a Raspberry Pi board, and requires a Phillips screwdriver and tape to assemble. You can see it working in the below video. Microcenter will be selling the Voice Kit for $24.99 starting October 28. The store will also be selling a bundle for $35, which includes a Raspberry Pi 3 Model B (the most powerful Pi board at the moment) with the kit. If you don't already have a Pi and you're interested in the Voice Kit, you should definitely get the bundle - the Pi 3 Model B usually goes for $35 on its own. You can preorder the kit or bundle from the source link below. It will also be sold by Pimoroni in the UK, but pre-orders are not live there yet.